Cardi B enjoyed a night out with her husband Offset after she revealed they were working on their relationship. The Bodak Yellow hitmaker hosted the Big Game Weekend Party at Oak Nightclub with her man in Atlanta, Georgia on Friday night. 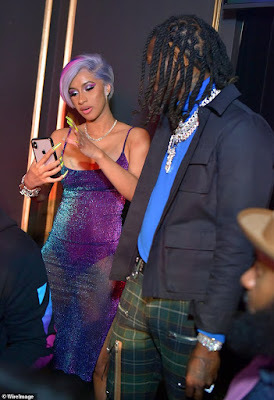 The couple did not seem that tactile but spent most of the night close to each other as they chatted with other guests including Offset's Migos co-member Quavo. 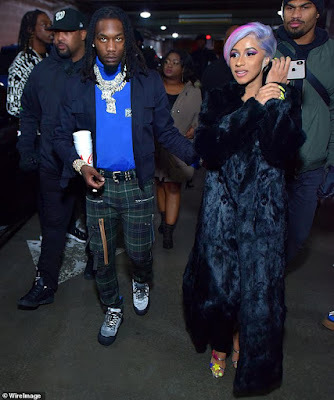 Cardi B had previously revealed the couple are working on their marriage for the sake of their daughter Kulture, six months. The rap sensation shared of her and Offset: 'I feel like we just really are a very regular couple. We just do regular things. 'I just feel like: We're famous ... we're really popular right now - I just don't know the obsession, like I feel like everything we do is a big deal,' added the New Yorker. 'Even before the bad scandals, just from the first time they seen us together, it was just like this big crazy deal,' Cardi explained.